Here at Wild Place Project we have a young pack of male European grey wolves. The grey wolf resembles a large domestic dog, but they have longer legs, larger feet, a narrower chest and a straight tail. They have thick greyish fur, which has a coarse outer layer and a soft undercoat. They also have very sensitive ears and nose to help track down prey. Wolves are highly intelligent animals with a complex social structure. We train our wolves daily as they are shy. We do this so that we can give them the best possible care. You can learn more about training our wolves at our keeper talk! Check out the 'What's On' board upon arrival for wolf talk times. In the wild, wolves have a very diversified diet that feeds opportunistically on what is most available in its habitat. The wolf diet may include large prey, such as moose, deer and wild boar, or small vertebrates, invertebrates, vegetables and carcasses. In the wild wolves can fast for several days when food is not readily available, so here at Wild Place Project we do not feed our wolves daily in order to mimic wild behaviour. Our wolves are fed four times a week on varied diet including the odd few berries as added treats. The berries are fed occasionally as wolves would often eat berries or other items in the wild. Wolves live in diverse habitat types which shows how capable the species' is to adapting to the most extreme habitat conditions. 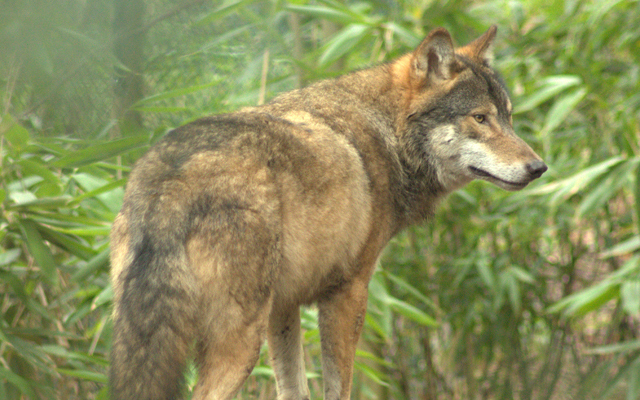 The European grey wolf is of least concern in terms of conservation status. However, human intolerance is perhaps the greatest threat facing wolves in Europe today. Fear, misunderstanding and the fact that wolves do kill livestock have created an uneasy relationship with people in many areas. You can learn more about the European grey wolves' conservation status on the IUCN Red List of Threatened Species website.